See more maps of Montana at the Montana Natural Resource Information System (NRIS) website. 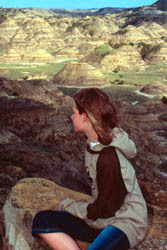 Montana is a vast and varied state of mountains, canyons, river valleys, forests, grassy plains, badlands, and caverns. Its "Big Sky" covers a land area of more than 147,000 square miles, making Montana the fourth largest state in the nation. In area, it can accommodate Virginia, Maryland, Delaware, Pennsylvania, and New York, and still have room for the District of Columbia. Yet, Montana's population is just 944,632 (2006 estimate), making it the sixth least populated state. There are fewer people living in the entire state of Montana than in the city of Phoenix. Montana is a word derived from the Spanish word meaning "mountainous." 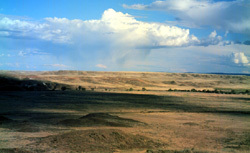 It is often termed the "Treasure State" and "Big Sky Country." All these nicknames refer to the beautiful and divergent landscapes encompassed within the boundaries of Montana. The Indians called the Continental Divide the "backbone of the world." The Continental Divide runs along the crests of the Rocky Mountains from Canada to Mexico, literally dividing the waters of the North American continent. Montana is known as a headwaters state because much of the water that flows to the rest of the nation comes from the mountains of Montana. Within its borders are portions of two major river drainage systems of North America. The Kootenai, Clark Fork, Blackfoot, Bitterroot and Flathead Rivers join the Columbia River, which flows into the Pacific Ocean. From its headwaters at Three Forks, the Missouri River empties into the Mississippi flowing to the Gulf of Mexico. Montana's two largest lakes are the Flathead (largest freshwater lake west of the Mississippi) and Fort Peck, a manmade lake with over 1,500 miles of shoreline! Throughout all of Montana are geographic treasures to be discovered. The eastern third of the state is plains country where the sky seems to find no limits. The central third is plains surrounding what are called "island" mountain ranges, and the western third, mountain ranges and valleys. In the southern central portion of the state is Yellowstone National Park with the world's most extensive area of geyser activity, harboring more than 10,000 thermal features. 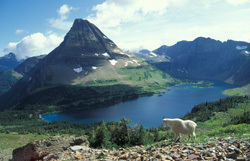 In the northwestern corner is Glacier National Park where spectacular mountain peaks were cut by glaciers. In the far eastern part of the state is Makoshika State Park where there are mysterious badland formations for visitors to see and enjoy.